Indiaplaza Blog For smart shoppers |: Revolution 2020 by Chetan Bhagat – Will corruption take over love this time? Revolution 2020 by Chetan Bhagat – Will corruption take over love this time? Revolution 2020 has nothing to do with sci-fi fictions as the name suggest. 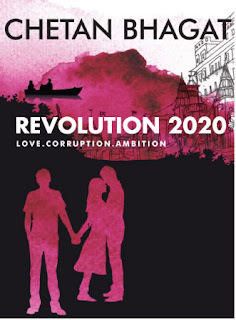 Revolution 2020 is upcoming book by the biggest selling English language novelist in India’s history quoted by The New York Times, Chetan Bhagat, which talks about love, corruption, ambition and all Indian youth want to read today. Chetan Bhagat, renowned author with four bestsellers Five Point Someone, One Night @ The Call Center, The 3 Mistakes of My Life & Two States has something new to offer this time. Revolution 2020 has backdrop of corruption with oomph of romance, love triangle and drama in the story based in the city with an exclusive character, Varanasi. Author suggests along with messages, there’s romance and a lot of drama this time. Revolution 2020 comes from his travels across India in the past two years. As a motivational speaker, Chetan Bhagat has visited more than 50 cities in the heartland of India. The youth in these smaller cities, their dreams and aspirations inspired him to do a story on them, adds Chetan Bhagat. This book is coming after Two States, a story about inter-cultural marriage nicely build up in story next-door theme. Dramatically Revolution 2020 is all set to provoke some serious thoughts about the corruption steeping too fast in our education system today. There is love and romance too in the story but it will be very interesting to see the blend of all this with the writing style of Chetan Bhagat to make stories gripping & entertaining. The wait is over now and you can order your copy of Revolution 2020 by Chetan Bhagat at Indiaplaza.com.